I got this in the mail and it didn't take a lot of effort for these three to intrigue me. How can something as black as charcoal promote whitening? And what-the-H is Acerola? 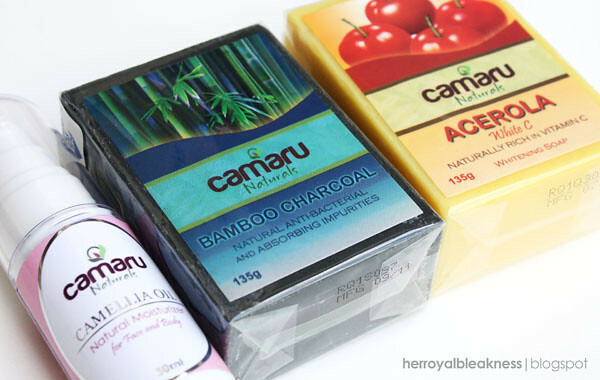 Camaru Naturals sent me their best sellers, Bamboo Charcoal and Acerola White C face and body soaps. Since anything whitening can degrade the skin's moisture, Camaru guys threw in an intriguing bottle of Camellia Rose moisturizer. I am honored to try these products out (they're proudly Pinoy!). I usually give soaps a good 3-4weeks trial time before the verdict, but if these two deliver fast, I may have to fill you in quite sooner. Owwwssss, di nga? These promises make me excited and skeptic altogether. I also noticed how Camellia Oil is integral to both whitening bars. It is among both soap's ingredient's list! CAMELLIA OIL (the most amazing anti-aging moisturizer today) is used by the Japanese and Chinese women for centuries to moisturize, protect, revitalize and nourish their skin. It is one of the most effective multi-purpose plant moisturizers. The CAMARU NATURALS CAMELLIA OIL is prized for its light texture, and ability to rapidly absorb into the skin without leaving behind an oil residue. It helps draw out impurities and smoothen rough and flaky skin and also excellent for use on hair and nails.. It is a tried and true, authentic anti-aging product with proven history of efficacy. It has been acclaimed as a "Miracle oil"
I've tried a roster of whitening soaps and the best so far is Likas Papaya. Psalmstre Placenta may be the fastest-acting whitening soap I've ever tried, but it dries my skin too much it results to skin rashes.Who knows, these two might be the best of both soaps and might be good contenders to replace good old Likas! Please don't forget to join the Neutrogena Fine Fairness BB Cream Giveaway Week 3! Disclaimer: This is not a paid post. Products were sent to me for review purposes; these three will be reviewed fairly, in accordance to how it fares during the trial period allotted. The Beauty Bin promises to give you unbiased opinions and honest takes on all reviews published in this blog. New soap! I love soap! Since, I started my de-stashing project, I can't buy anything other than soap because it's the only one beauty thing na mabilis maubos.